Building, tinkering, collaborating, discovering, exploring, making, creating, and communicating. What do all of these words have in common, well besides that they all end with –ing? All of these actions describe a makerspace. A makerspace is an area where students have the space to explore and collaborate while applying 21st century skills such as critical thinking and problem solving. In makerspaces creative tools such as cardboard, Popsicle sticks, LEGOs®, and technology such as 3D printers and robotics are used. Many schools and libraries are redesigning their learning spaces and pedagogy by using furniture that’s flexible and mobile for students to collaborate while easily connecting them with technology. Some of the furniture you may find in these learning spaces and libraries is made by Spectrum Industries Inc. Spectrum innovates products for the 21st century modern classroom such as tables, mobile computing carts, lecterns, and more. 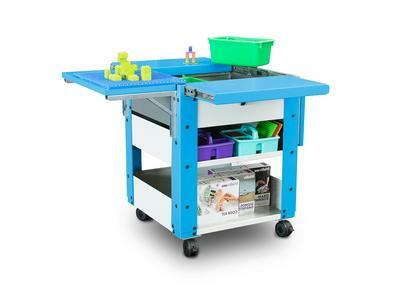 One of the newest product lines Spectrum has developed is its makerspace carts. The Builder Cart and the Discover Cart were designed to help with classroom storage needs, allow students to engage with one another, and to give students the opportunity to work in a place that suits them. Fall Creek Schools in Wisconsin is a school district where active learning is often found in its classrooms. Fall Creek teachers Joell Anders and Terry Anders provide many activities for their students that involve hands-on learning. Joell Anders, First Grade teacher at Fall Creek, utilized the Builder Cart in her classroom and it was hard to tell who loved it more – her or the students. The Builder Cart features two flip-up shelves and two slide-out shelves that have magnetic friendly surfaces, providing endless creativity opportunities. In addition, it is mobile, provides storage space, and its height can be adjusted from 30”-36” to fit every age group. Second grade teacher, Terry Anders, had both of Spectrum’s makerspace carts in his classroom. Many students in Terry’s classroom used the Builder Cart to collaborate with other students while working on laptops and the Discover Cart was used to house the class’s coding kits. Spectrum’s other makerspace cart, the Discover Cart, was developed to store and transport educational robotics and coding systems like Lego’s WeDo construction sets. It can also store and charge up to 10 notebooks, Chromebooks, or tablets and its lower shelf can store up to 10 bins. The Builder Cart and Discover Cart are two of Spectrum’s newest makerspace products that encourage collaboration, creativity, and 21st century skills. Can you see one of these carts in your classroom or library? Request a demo or learn more about the Builder Cart, Discover Cart, and other makerspace products Spectrum offers at http://www.spectrumfurniture.com/en/categories/makerspace.